Unique to the state, Wisconsin’ s Plow Museum, also known as Ed’s Machine Shed, is a collection of 39 restored plows from 1915-1955. A few tractors are included in the collection. 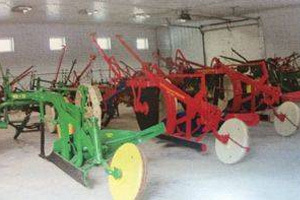 The plow museum is open Fridays, Saturdays and Sundays from 10:30 a.m. to 4 p.m. at no charge. Donations are accepted for upkeep. It is handicapped accessible. Ladysmith resident Ed Tomasovich, who has acquired the collection over the years, donated it to the city in exchange for the construction of a building to house it. The red, barn-like 60 foot by 70 foot machine shed has 4,200 square feet of space with two extensions for overflow space. 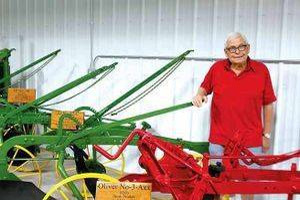 Ed Tomasovich is passionate about collecting and restoring antique farm plows. 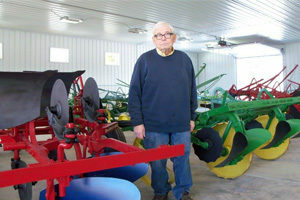 He has restored nearly 39 vintage plows and tractors. Each one meticulously disassembled, hand sanded, painted and reassembled piece by piece. Ed still vividly remembers growing up on a dairy farm in Rusk County. Ed has agreed to donate his renowned collection of 39 completely restored vintage plows to become a major part of the Rusk County Historical Museum. Have you ever seen a gasoline sad iron? The sad in sad iron is an old word for solid, so the name a sadiron means something bigger and heavier than a flat iron. Sad irons generally weighed in at 5 to 7 lbs. The wood handle keeps the hot metal away from hands and reduced accidental burns. As the gasoline burns in that canister behind the handle, it heats the iron!! Can you imagine pushing a 7 lb gas fired iron over freshly laundered white shirts!! The add below is from a Sears Roebuck catalog and shows two similar sadirons like the one sitting on the doily. One sold for $3.99 in the early 1900s and the other sold for $5.99 !! Nowadays, we rarely use the modern plug-in kind !! It takes time to iron a shirt or a skirt. Fabrics have changed and plus we make sure we take those shirts out of the dryer before a wrinkle has time to set!! These and other unusual and interesting everyday items are on display in the 20's house and the Vintage Building.